If you have children, mine was furry and four footed grin, you will need to start organizing their clothes and other belongings as they get taller. Like most closets, it all depends on what sort of space you have as to what you can accomplish but there are a few basic things you should consider when tackling this task. Firstly, how old is your little one? One of the biggest things with most adult closets is that little ones can’t reach the closet rod to hang up their clothes. Simply place the closet rods lower and if possible, have the rod on adjustable flanges as in the picture. 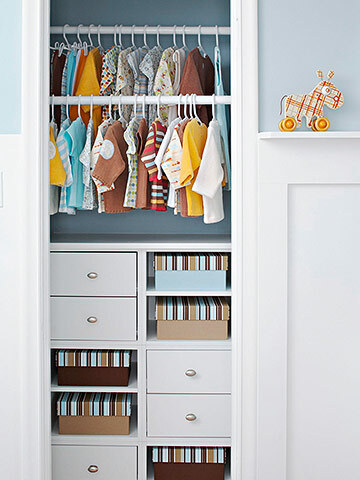 Rods for kids can be placed behind each other as well since the dimensions of kid’s clothes are smaller and take up less room horizontally. One of the problems with a lot of kid’s closets is they become a catch-all for everything. If you’re going to have things in your little’s closet, put them in baskets or bins that can be placed on easily-reached shelves. To make it easier, label the baskets or bins so that you’re not the only one that knows where everything belongs or is located. Consider having a bin for laundry as well. Kids love tossing their dirty clothes in a bin just for that and make it fun by maybe adding a basketball hoop to it 🙂 Just like grown-ups, utilize the upper reaches of the closet with bins of off-season clothing or things not often used. It’s always easier to put them up there so there is more space lower for often used in-season clothing items. Something to consider, if you have the room, incorporate maybe a small desk and chair in the closet. I’ve seen some really cute nooks that have a mini desk in them. Kids love small hidden spaces and that will be like their own private office. Keep in mind, you’re going to have to change the closet around in a few years to keep up the pace of your children growing up. Go with a neutral white if you don’t want to change the cabinetry but if you’re willing to change the colour around in the near-future, have fun and go with something colourful and in character with your kids! This can also apply to the doors of the closet. Consider painting a mural on the exterior of the doors or even cutting them into a fanciful shape such as a castle or maybe a dinosaur landscape. I’ve seen some closets with drapes on them since heavy closet doors are not always easy for little hands. I know it’s a bit of a task organizing yourself let alone your little ones but try to make it a fun prospect. And when you’re ready for some design help and constructing your custom closet, call us up. 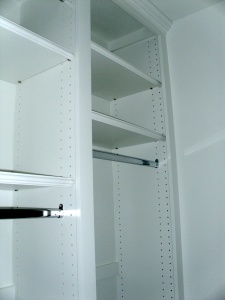 We’re always willing to help here at Space Age Closets and Custom Cabinetry!